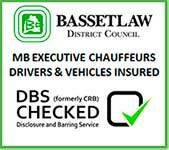 Thank you for visiting https://www.mbechauffeurs.co.uk ("Website"). This cookie notice applies to the Website or branded pages on third party platforms (e.g. Instagram, Facebook, Twitter) and applications accessed or used through such websites or platforms which are operated by or on behalf of MB Executive Chauffeurs Ltd. The law states that we can store necessary cookies on your device to help to make our website usable by enabling basic functions like page navigation and access to secure areas of the website. The website cannot function properly without this cookie. For all other types of cookies, we require your prior consent. The following types of cookies are used on MBE Chauffeurs websites. Necessary cookies - These are cookies that are strictly necessary for the operation of a website. Without these cookies, this website won’t work properly. Accordingly, we are not asking you for your specific consent for those cookies. For all other cookies your informed consent is required. Session cookies - Session cookies are temporary cookie files which are erased when you close your browser. When you restart your browser and go back to the site that created that cookie, the website will treat you as a new visitor. Persistent cookies - These cookies remember the content you previously viewed on this website. Statistics cookies - (either persistent or session) help us understand how visitors interact with our website by collecting and reporting information anonymously. This is statistical data about our users' browsing actions and patterns and does not identify any individual. Marketing cookies - (session) are used to track users across websites. In addition to reporting website usage statistics, Google Analytics can also be used to help show more relevant ads on Google properties (like Google Search) and across the web and to measure interactions with the ads Google show. DoubleClick cookies contain no personally identifiable information. Sometimes the DoubleClick cookie will contain an additional identifier that is similar in appearance to the cookie ID and is used to identify an ad campaign to which a user was exposed previously. We will not use any information reported by Google Analytics Demographics and Interest Reporting to identify any individual user of our site. The table below explains the cookies we use and why. Please note, however, that if you delete cookies or refuse to accept them, you might not be able to access certain parts of the website and some of our pages might not display properly. A number of websites provide detailed information on cookies, including www.aboutcookies.org and www.allaboutcookies.org.